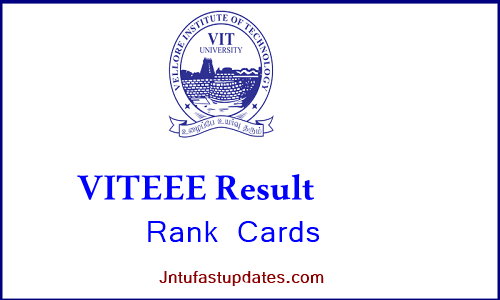 VITEEE Result 2019 : Vellore Institute of Technology (VIT) has conducted the VIT Engineering Entrance Examination (VITEEE) from 10th to 21st april 2019 at various examination centers. Competition is high for VITEEE examination this year. All the aspirants those were competing for VITEEE examination are eagerly waiting to check their result. The Vellore Institute of Technology is going to release the VITEEE result 2019 in last week of april (tentative). All the students enrolled and appeared for the examination can download the result from VIT official website, vit.ac.in. The VIT also announces the rank, merit list along with the results. Vellore Institute of Technology (VIT) is one of the most popular educational organizations in India, Many of the students dream to study in VIT. It conducts the Engineering Entrance Examination annually to affirm admission for aspirants based on their performance in the examination. Candidates qualified in the examination will get admission into Engineering courses such as BE/B.Tech. Students can get vit university results 2019 those who attempted exams in their respective slots. This year almost 2 lakh above candidates were competed to get admission in VIT University. There are nearly 40,000 seats available in VIT. Students need to score the best rank in VITEEE examination to get admission. All the hopefuls those have attempted the VITEEE examination can download the results from April from the official page, vit.ac.in. Students can also download the VITEEE scorecard, rank along with results.The VIT is going to conduct the web counseling for qualified candidates soon in the month of May. Regularly follow the VIT website for latest information regarding the counseling dates, joining dates and other information. How to Check VITEEE Results 2019 & AIR (All india rank cards) ? Visit the VIT University at vit.ac.in. Find the VITEEE 2019 Rank or Scorecard link and click it. Sing in with Login ID and Password following the instructions. Finally, click on the VITEEE 2019 Results that will be displayed on the screen and then Download your Result. I got the rank – 172146. Will I get in? when will result of Viteee will declare????? SIR, MY RANK IS 8382 (GEN) ANY CHANCE TO GET SEAT IN CSE BRANCH IN VELLORE CAMPUS. SIR, MY RANK IS 8382 (GEN) ANY CHANCE TO GET SEAT IN VELLORE CAMPUS. VITEEE 2017 Results has been Declared!! Check now and Discuss your rank with us. for Admission in Desired Branch/Campus. sir my rank is 162167.